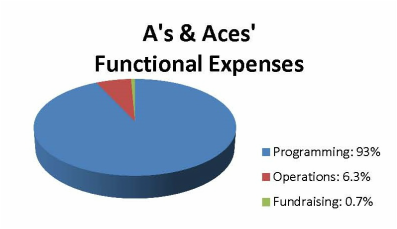 As a 501 (c) (3) public charity, all donations to A's & Aces are tax deductible. (EIN number: 26-1905295). To donate online with your credit card or through PayPal, click the Donate Now button below. Complete your donation in just a few clicks. Thanks to all of our volunteers and in-kind donors! Their support that helps keep our operating expenses low. A's & Aces will then send a letter of acknowledgement to all parties. Donation information: For more information about making a donation contact us at Administration@AsAndAces.org. This organization is a Gold-level GuideStar Exchange participant, demonstrating its commitment to transparency.